Well, I have started teaching classes and doing workshops again for Stampin'Up so I have been creating up a storm but mostly with Stampin'Up products so I almost always update my other blog on a regular basis (www.creativitywithstamps.typepad.com) and just don't have much time to keep this blog updated as much. I wanted to share a mini album I finished a little while ago featuring my week's vacation in Sardinia, Italy this past summer. Here's the slideshow of the album. I used a hodgepodge of goodies I had from Stampin'Up to Hambly to BasicGrey and a few others. Enjoy!!! Just wanted to take a moment to wish you all a fabulous holiday!!! And I also hope for a wonderful new year 2011 to all my family, friends and blog readers. I made these last minute tags yesterday....I am finally done with all the homemade goodies and they have all been given out...so thankful it's over!!! 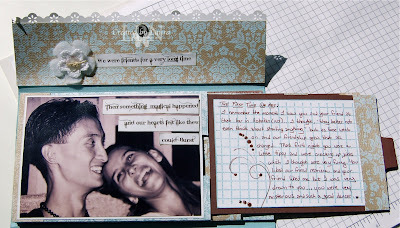 I just posted a new layout in my Stampin'Up blog...here's a little peek. You will need to visit www.creativitywithstamps.typepad.com to see the full layout and details. I am having issues printing exactly what I see on my screen to my printer. The colors are never the same and I can't seem to figure out what is wrong.The pictures show my Photoshop settings and my printer settings. I have a mac laptop, Photoshop CS2 and an Epson R1800. I always print on Epson paper so I know that my paper is not the issue. Can anyone help me out? Matteo started 2nd grade and Elisa started 1st grade...it's amazing how fast these little ones are growing...I can hardly pick them up anymore. Paper is from Webster's Pages and cardstock is all Stampin'Up. Brads and ribbon are from Stampin'Up. Stamps are from Fontwerks (really miss that company) and PapertreyInk. 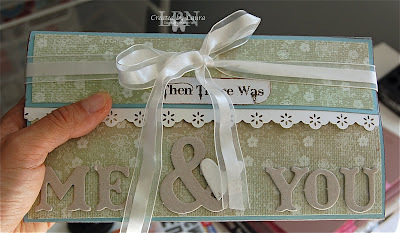 I just posted a few pics in my Stampin'Up blog of a new layout I finished yesterday morning...I have a sneek peek in this blog but if you click HERE you'll see more detailed pics and full supply list. Ok...remember I told you that I took a BIA class? 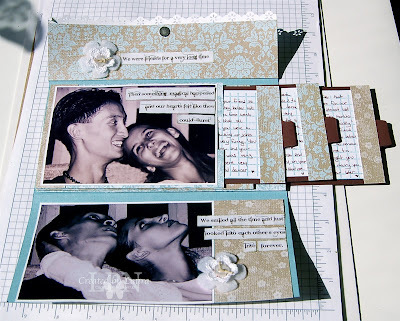 This is one of the projects we made...a little 4X4 album. I really enjoyed making this little book; it was my first time at using corrugated board (which I am in love with now) and finally breaking in my Hambly rub-ons. This is my beloved Bind-It-All Guide. I have had this machine for a while now but I really needed help in figuring out how to use it properly so I took this amazing online class from Nan Natuzo and she made us all make a wonderful and useful guide to help us bind our projects perfectly every time!!! I have been a busy worker bee and have been creating up a storm in my studio. However, I have also decided to dedicate a lot more time to my family...kids have started school and activities and they are keeping me on my toes. I had a little time today while eating my mid morning snack and decided to upload and edit some recent photos. Here's a photo of a card I made for my dad's birthday in August. I used PapertreyInk products. I have been busy just settling in our new place, organizing the house (especially the new scrap room), driving the kids at different events, working out (finally after a year of laziness) and playing around with my scrap/stamp goodies. Oh...and Elisa's birthday is coming up in a few weeks and, as always, I made the party invitations. I used a plethora of new things I had bought over the last few months. The ribbon pulls up to reveal the party details. My really good friend Michelle from California sent me this award the other day totally catching me off guard. I've not been really good at posting lately...most of you know about my third move of the year and the flood so I am not going into any additional details. Hope you will all have a wonderful weekend!!! Yes...over two months since my last blog. You see, Stampin'Up has given demonstrators new agreements (which I did sign) and I needed to take some time to figure out what I could post or not post without violating the "new" rules. 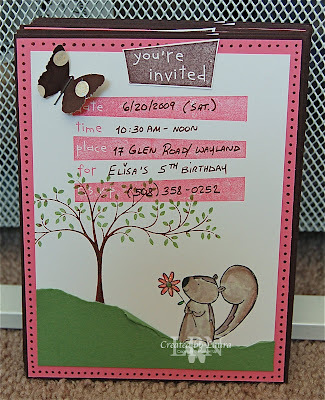 I posted a new card in my Stampin'Up blog HERE using some colors I rarely use. I just posted a few pictures of a mini album I made for my dad's birthday...very summery!!! My friend Gio' surprised me with this a few weeks ago and I was really taken by surprise and well, she just made me smile from ear to ear. It took me this long to post it here but nonetheless, I wanted to pass it along to a good friend of mine Serena. I have built a very strong friendship with these two women even though I met them online and spoke to them on skype only so far...I feel as close to them as I would any other close friend here...they have made my life a little brighter!!! On a side note, I just wanted to let you know that I have been on a shopping spree this summer and purchased a few goodies for my crafting. I had been researching various computerized die cut machines and I decided to get this one primarily because of all the great reviews and resources I have been able to find. I bought mine for $269 (free shipping/tax) and it included a 12x12 mat, two cartridges and a spatula at OhMyCrafts (if you can not see this deal there, they have an ebay store and that is where I got mine). Here's a new layout I did a little while ago using some scraps of papers I had left over from a previous layout as well as a test paper I did with my new glimmer mists. I have been a busy bee in my craft room lately. I had finally received some new goodies from the brand new 2009-2010 Idea Book & Catalog from Stampin'Up and was inspired to make some projects. P.S. Don't forget to sign up on "Feedblitz" under my photo so that you can get automatic updates of that blog!!! My daughter is turning 5 and I have made her birthday invitations since her very first birthday party. I really have been missing that Wild Wasabi color...love that green.